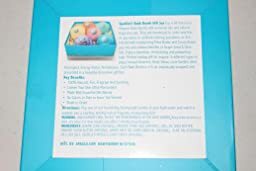 SpaGlo® Organic Bath Bomb Gift Set - MAKE AN IMPRESSION and give someone special a luxuriously pampering SpaGlo® Bath Bomb Gift Set. It makes a perfect gift for ANY Occasion...a Shower...Bridal Party...Birthday...Holiday...or just to treat yourself! Every detail of this product is created with love and will make you...a co-worker, parent, friend or loved one feel special and pampered! 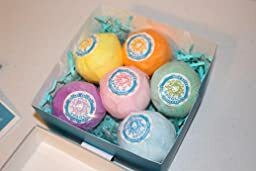 It has 6 extra large 4.5 oz bath bombs made with all natural & organic ingredients, essential oils and is free of any stains or artificial coloring, parabens, SLS. Up to 90 % organic ingredients. Infused with moisturizing Organic Shea Butter and Organic Cocoa Butter, Organic Citric Aicd plus anti-oxidant benefits of Grape Seed, Avocado Oil and Olive Oil. Wonderfully moisturizing but not greasy in the tub. Leaves skin soft, silky with a wonderfully mild scent that is fresh smelling and not perfumey. 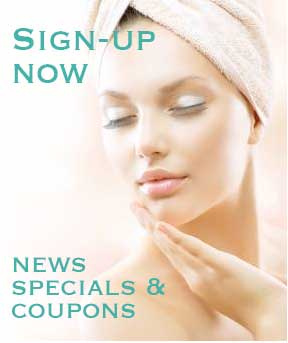 -CHILLAX and Enjoy a relaxing, luxurious, moisturizing and pampering bath. -Each bath bomb is a different blend of essential oils to target different issues. -Individually wrapped, labeled and beautifully presented in a decorative gift box. These are MADE FRESH in the USA and twice the size of top selling brand...so you get more for your money. Buy two or three and have them on hand ready to give. Stock Up and Save! Directions: Pop one of our nourishing, fizzing bath bombs in your bath water and watch it explode into a swirling, twirling ball of fragrant, moisturizing fizz! Contains:Baking soda (natural), Organic Citric Acid (natural), Kaolyn Clay, Organic shea butter, cocoa butter (natural), Grape Seed oil, Sunflower oil (natural), Olive Oil, Essential Oils, Sugar (natural), Sea salt, Distilled Water & Corn Starch (natural). These are exquisite bundles of softness, scents and relaxation. You don't take baths anymore? You will with one of these sitting around. They come beautifully boxed, perfect for gift giving. When you open the box, the whiff of scent is enough to entice you into drawing up a bath right away. But alas, I had to wait. When I finally had the chance to try them out, it was worth the wait. They fizz and dispense beautiful fragrances and softness into the water so that when you get out, you smell great and your skin has been treated nicely as well. I've used bath bombs before and they seem to tease. They don't last very long and aren't very large. These XL versions are great for a full bath and a long soak. I love the scents in here and would be proud to send this as a gift to a family member or friend. Sample provided for review. Bath Bomb? What? Explosions in my bathtub? No I don't want that. A ball that makes bubbles in the tub? I don't need that; bubbles in the tub are not a good thing. Oh wait a minute; these are bath salts that bubble. And they make the tube smell wonderful with essential oils. And then they soften the water so it feels like a spa. Ah, yes that's what I want. These are really incredible. SpaGlo has chosen some amazing aromas to mix. Combinations I would never think work together. The first time I used one of these the whole house smelled like a spa. I've used effervescent bath salts before. They are hard balls or discs that bubble very slowly in the bottom of the tub. They also work in the shower. These are completely different - the second they hit the bath water they bubble like crazy. At one point when the ball gets really tiny, it actually shoots around on the water. Honestly, it is way too much fun to watch. Bubbles are fun, but the oil and the softened water are the big payoff. There is exactly the right amount of oil in these bombs. They don't coat the tub with oil or grease. Instead the oil is nicely suspended in the water. The salts left over leave the water wonderfully soft. The box these arrive in is so beautiful. This is ready to be presented as a present. Until I tried my first bath bomb I was not quite sure why it was called a Bath Bomb... I took a video and you can see that it fizzes like an explosion. The scent is light and pleasant. Each bomb is a one time use product, the entire bomb fizzes away in about 1 minutes leaving the scented water infused with a moisturiser. I now tried a couple of different bath bombs, some generate bubbles like bubble bath but SpaGlo bombs do not. There is a bit of foaming as the bomb fizzes and then the foam quickly disappears. Overall a very pleasant and relaxing experience. What can be better? The packaging is pretty but the teal netting on the package is covered with sparkles which fall off and it takes quite a bit of work to clean them up. Sparkles give a pretty effect, but I hate the extra clean up - sparkles stick to the floors and counters and it took cleaning with a wet cloth Swiffer to get them all. I would have been happier with a plain teal netting. This is a 5 star product, but I did not like the packaging. Based on my experience if you open the package on a newspaper you can avoid the clean up. This bath bomb is provided by SpaGo. I combined the awesome aroma of these bomb's with a nice hot Jacuzzi and I was in Nirvana. After a very stressful weekend this was just what I needed. The aromas of these bath bombs are incredible. The scent it leaves on your skin is subtle. The feel of your skin when you get out of the bath now feels as soft as a babies bottom. Each all natural bomb is meant to have a different function - from relaxing (the Lavender and Chamomile) to decongesting a clogged nose (Eucalyptus, peppermint and pine) There is even one that can give you a bit more energy! Packaged in a lovely box in a nest of curly packaging material, all wrapped up in a glittery bow and wrapping tissue, this is going to make the perfect gift for..maybe Mother's Day, a Wedding Shower gift or even a Just Because I Love You gift. These won't stain your tub and do well even in hard well water, like I have. I think I'm going to get more of these and permanently move into my tub - I'll never get out. The only thing better would be a bomb that smelled like chocolate!!! These bath bombs make a lot of fizz and are very fragrant. They also leave your skin soft. I put the ginger detox scent in the tub, noticed it released some white tea leaves, so if that bothers you, you might want to put the bath bomb in a nylon netting before submerging it. These are strongly scented and leave your skin very perfumed and there is cocoa butter in the formula. They are very good quality and quite luxurious. I hope they make a rose scent in future. I received a box in exchange for evaluation and review. I wish reviews had a way to let someone experience smells. Each one of these bath bombs smells divine. Each having a different wonderful aroma from the other. These don't smell anything like the cheaply perfumed bath products you get at discount stores. These are like something you would get in a gift shop or at a craft show. Made with care and wrapped so well for gift giving. 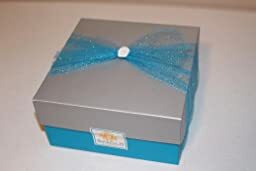 They arrive in a gift box with a tied glittery bow wrapped all the way around it. Inside the box the bombs are sealed in a clear plastic, that way moisture doesn't get to them. And then each bath bomb itself is wrapped up in a different color tissue paper. But even before opening the packaging, I could smell them all. Dropping one into a hot bath released the aroma even more and makes the whole bathroom smell wonderful and relaxing. These are awesome and anyone who loves baths will enjoy these. This was a gift for my mom and she loved it! 5Just had lunch with her and I asked how she liked them. Gave as a gift for my granddaughter for Christmas. Just had lunch with her and I asked how she liked them.. She said she loved them, they were the best. So relaxing. I may have to order some for myself in the near future. Thanks for a great product. gift. person said they were the best and so relaxing in the bath. 5Perfect for a gift . Very nice. I am not normally a bath person but, adding this bath bomb to the tub made it nice and relaxing.I felt like this product is perfect in size for the average sized tub. My skin felt moisturized after soaking in the tub with my bath bomb. Great packaging. Perfect for a gift. Smell could have been stronger. Expensive. I love bath bombs and recently I received a package from Spaglo. These are 100% Natural and they smell divine!The X-Large bath bombs individually labeled and wrapped. These were perfect in the tub and I love the scent it left on my skin and the fact that they treated my skin with tender loving care! Thanks to the Spaglo bath bombs, Mother's day was a huge success. Every mother deserves to be pampered, and I think a nice warm scented bath should do the trick. If your mother is stressed out and wants to get away from reality--even for just a moment, I think the bath bombs will be the perfect solution to relieve the body and mind. My mom feels like a goddess living in complete bliss and I believe this was the best Mother's day gift so far. I ordered these recently and received them a few days ago. I have only been able to take one bath so far( i decided to go with the LOVE GARDEN), but let me tell you..... I'm in LOVE with this product. My skin felt so soft and smooth after , that I didn't even need to moisturize! The aroma is amazing as well, I am extremely satisfied with this product! I love that these are organic,.Again, a very happy customer here, I will definitely be purchasing this product again! Great bath bombs! Got them for my wife and their aroma is so strong and relaxing - it's great! Definitely leaves your skin feeling soft and smooth. We loved that these, unlike many cheap ones we've used before, were well formed and didn't crumble and fall apart to quickly dissolve. It stayed together until it finally, slowly, disappeared into the water. Didn't leave lines in the bathtub (from dyes), smelled great. Thanks to the seller . These bath bombs are great, smell fresh and come well packaged and nicely presented. The follow up by Spaglo about my experience with the bath bombs was a nice touch by ensuring that I as a customer was fully satisfied with the product. In the bath tub they are wonderful and relaxing and highly recommended. I purchased these bath bombs for my wife for Mother's Day. She's truly an essential oil expert, and was absolutely delighted with this product. She's found them to be very potent, effective, and expertly blended. We will definitely be reordering!! 5My skin felt so soft! I enjoyed my bath with the Lavender & Chamomile bath bomb. I put it in my soaking tub after I had ran a warm bath of water. It started making an alka setzer sound bubbly sound. While it made the noise the pleasant soft fragrance was emitted into the air. I sat in the tub for about 15 minutes. The oil from the bath bomb covered my skin like soft silk. 5Spaglo has really made an OUTSTANDING product. These bath bombs come in the cutest container that looks really cute setting in my bathroom. When you open the container you will see 6 of the cutest little bath bombs that are individually wrapped and tagged with their own name. Each bath bomb contains only natural ingredients and blends of unique Essential Oils. Just draw your bath like you normally would and then drop a bomb of your choice into the water and it will start to fizz. It will fill your bath with a great fizz and aroma of the essential oils. These are so relaxing and make me want to stay in the bath FOREVER!! !